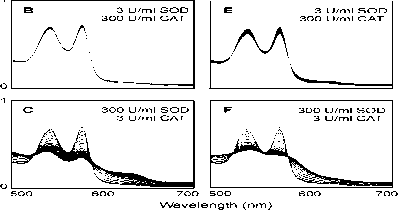 We use absorbance spectra to follow the effects of superoxide and hydrogen peroxide on the Hb components of PolyHb and PolyHb-CAT-SOD (D'Agnillo & Chang, 1998a) (Fig. 4.6). 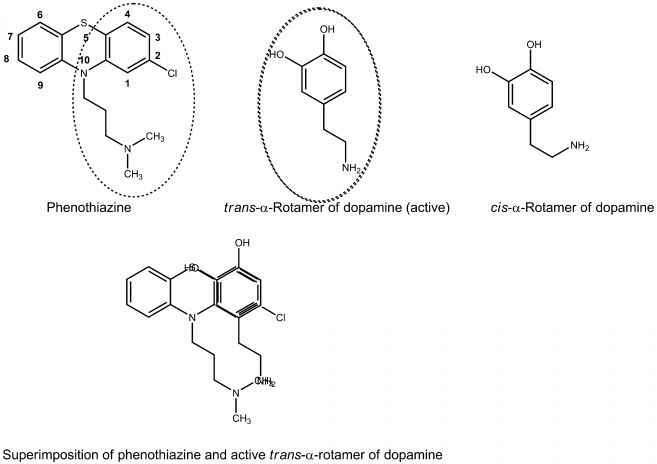 Xanthine-xanthine oxidase is used to generate superoxide (Fig. 4.12 ABC). For PolyHb, this results in a stepwise decrease in absorbance at 540 and 577 nm, showing that Hb (Fe2+) is oxidized to metHb (Fe3+) (Fig. 4.12A). Increase in metHb (Fe3+) is shown as a stepwise increase at the absorbance peak of 630 nm (Fig. 4.6A). PolyHb-CAT-SOD with a SOD/CAT ratio of 0.01 prevents this oxidation (B), while a SOD/CAT ratio of 100 produces no protective effect (Fig. 4.12C). A glucose-glucose oxidase system is used to generate hydrogen peroxide (Fig. 4.12 DEF). The ferryl (Fe4+) intermediate is shown by the appearance of new peaks at 545 and 580nm (Fig. 4.12D). PolyHb-CAT-SOD with a SOD/CAT ratio of 0.01 reduces this oxidation (Fig. 4.5E), while a SOD/CAT ratio of 100 produces no protective effect (Fig. 4.12F). oxidative challenge with exogenous superoxide (O2-) produced from xanthine/xanthine oxidase.